If you long for the open ocean but bristle at the thought of all-night discos, thousand-seat dining rooms or congested Caribbean ports-turned-duty-free-shopping-malls, know this: You can enjoy a cozier atmosphere, personalized setting and service, and destination-driven itineraries on a cruise. Not all cruise ships are vast, floating resorts. A burgeoning industry niche revolves around small vessels -- a wide-ranging group that includes yachts, rugged expedition ships, riverboats and classic sailing schooners -- where passenger counts top out at closer to 300, rather than 3,000. 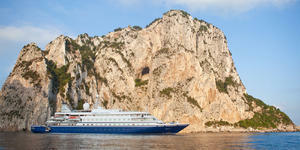 Before we launch into our picks for the best small ship cruises, let's answer one question: How do we define "small"? For this story, we're going to stick with vessels that accommodate fewer than 500 passengers, spanning the market from rugged expedition ships to super-luxury yachts. 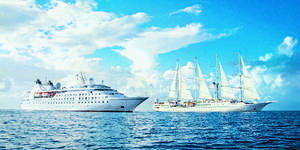 Now check out our small ship cruise comparison below. 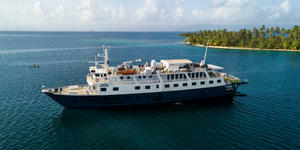 Lindblad Expeditions, allied with National Geographic, offers soft-adventure cruises on a fleet of nine capable vessels (as well as several charters like the Delfin II riverboat and Sea Cloud masted sailing ship) that carry from 48 to 148 passengers. Serving more as base camps for exploring the world's waters, the line's ships cruise to all seven continents, including the Galapagos, South Pacific, Antarctica and the Arctic. 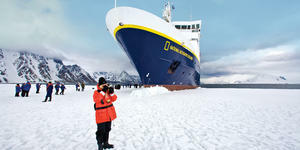 Topflight naturalists, historians, undersea specialists and expedition leaders accompany each trip; many itineraries also have National Geographic photographers or at least a Lindblad-National Geographic-certified photo instructor. Besides kayaks and Zodiacs for landings, ships are equipped with scientific tools like hydrophones (to snoop on marine mammals), underwater cameras and video microscopes. Norwegian-based cruise line Hurtigruten plies the poles with 15 ships of varying sizes. 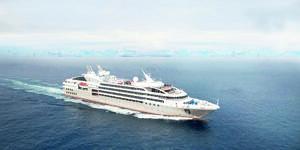 On the horizon in 2019 is its forthcoming flagship, 530-passenger MS Roald Amundsen. 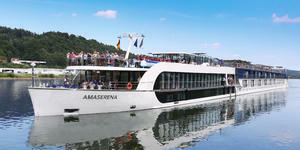 It will be the first of two hybrid propulsion ships that will reduce fuel consumption and CO2 emissions by 20 percent. 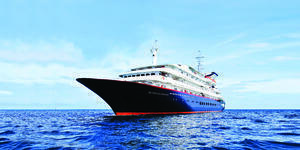 The ship features suites and cabins with balconies, as well as ocean-view staterooms. The Expedition Suite even has a private outdoor hot tub and comes with amenities like a bathrobe and espresso maker. Don't let the trappings fool you though -- these cruises are all about nature. Like other expedition vessels, MS Roald Amundsen has its own small landing crafts that take passengers to incredible seaside locations. Passengers are an international mix, and the ship -- which will operate in English and Norwegian -- adds other languages, such as German or French, if needed. 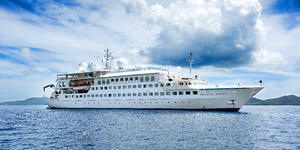 Silversea's four-vessel expedition fleet (Silver Galapagos, Silver Cloud, Silver Explorer and Silver Discoverer) upholds the line's luxurious all-inclusive image. All passengers -- on ships accommodating 100 to 254 -- enjoy spacious suites, complete with butler service and high-end touches (Prastesi linens and amenities from Ferragamo, Bulgari or SebaMed). Expedition cruising with Silversea means you'll visit a good mix of mainstream and less-crowded destinations (Galapagos, Polynesia, Micronesia and more) throughout the world's seven continents. Itineraries include complimentary shore excursions, such as Zodiac tours, nature hikes with certified guides, snorkeling and kayaking. Whether you want penguins or polar bears, Quark Expeditions, which specializes in Arctic and Antarctic journeys, has something for you. Several of the line's seven ships have onboard helicopters, as well as kayaking, cross-country skiing and mountaineering equipment (not to mention the ever-present Zodiacs). 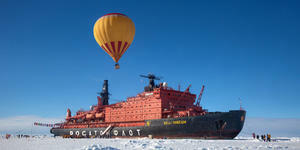 The line's 128-passenger expedition vessel, 50 Years of Victory, has nuclear-powered capabilities to go through nearly 10 feet of ice and makes the voyage to the North Pole. Quark's Antarctica trips often go longer and farther south, with more varied itineraries than other lines. 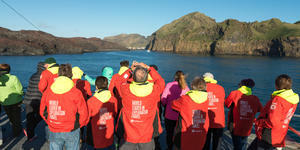 Days at sea are full of lectures and presentations from scientific experts and, on some vessels, photographers. Ship features for the premium brand vary. Try Ocean Endeavour to avoid single supplement pricing, eco-friendly Ocean Diamond (completely carbon-neutral) or Scandinavian-style Ocean Nova with its glass-enclosed observation lounge. Celebrity's Galapagos cruise ships combine the line's modern style and focus on service and cuisine with a local, small ship ambience. Destination-oriented features are incorporated into the onboard experience; they might include a performance highlighting Ecuadorian folklore on Xpedition and regionally inspired sustainable decor in the upcoming Flora. The new ship, which is custom-designed for sailing the Galapagos, will also feature cabin automation and environmentally friendly systems, including anchorless technology (dynamic positioning) and in-room water filtration stations. UnCruise Adventures offers adventure cruises and river cruises that are meant to appeal to people who might not normally cruise. The line's nine vessels, holding between 22 and 90 passengers, sail to Alaska, Costa Rica and Panama, coastal Washington, Hawaii, Galapagos Islands, British Columbia, Mexico's Sea of Cortez and the Pacific Northwest's Columbia and Snake rivers (the line's only river destination). The line doesn't do many typical port stops, preferring to pause in inlets and bays that offer maximum exposure to nature and wildlife. Vessels come equipped with kayaks, standup paddle-boards, snorkeling equipment and hot tubs onboard for relaxing after a day of hiking or paddling. As the diverse fleet incorporates upscale expedition ships, yachts and even a replica turn-of-the-century steamboat, onboard offerings vary. Expect thoughtful premium appointments and amenities throughout, though, with fitness areas, lounges, libraries and mealtimes highlighting gourmet, locally sourced cuisine and fine wines and microbrews. 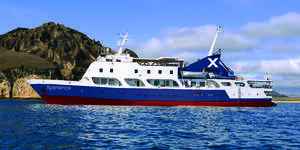 International Expeditions, offering passengers soft adventure, small-group journeys with a focus on nature, runs cruises to the Peruvian Amazon (aboard 19-suite Zafiro or 40-passenger M/V Anakonda) and Galapagos (on 32-passenger M/V Evolution). Step out onto your private balcony (in the Amazon only) or the sun deck (where Evolution also touts a hot tub) to enjoy the passing scenery, when not partaking in immersive shoreside experiences anchored on natural and cultural encounters. Ship atmosphere is informal, and trips are more focused on excursions and lectures led by naturalist guides and expedition leaders than on many shipboard diversions (though you can expect onboard comforts like air-conditioning and well-prepared, locally inspired fare). Partake in active excursions like kayaking and piranha fishing in the Amazon, or snorkeling, swimming and hiking in the Galapagos. For the tall-ship enthusiast, there's nothing quite like sailing under a starry or sunny sky, powered by the bluster of ocean winds. If you want to float along with the wind while exploring less-traveled ports in the Caribbean and Mediterranean, Star Clippers is tough to beat. The fleet's three vessels -- flagship 227-passenger Royal Clipper and 170-passenger twins Star Clipper and Star Flyer -- are some of the fastest clipper ships ever built. Feel the sails catch the breeze, help with the raising and trimming, or morph into a spider and climb high in the rigging. Onboard, passengers don't adhere to rigid timetables as they might on more conventional cruise ships, and the evening dress code is always elegantly casual (with the exception of themed evenings, like Pirate Night). Water sports are also a major component of each tall ship sailing cruise, with complimentary snorkeling, kayaking, sailing and other sea-based activities offered directly from the ship. The result of this pleasing "motorized sailing yacht" experience is that passengers can revel in the romanticism of sailing, without having to sacrifice amenities. While touting plenty of plush yacht-worthy appointments to properly pamper guests, the line doesn't get too stuffy: "Casual elegance" is the designated dress code, and that idea permeates the onboard vibe. Passengers leave ties and formalwear at home in favor of country-club casual sportswear, day and night. One of our favorite features -- available on each of Windstar's vessels -- is the water sports platform, with its range of complimentary water sports (snorkeling, wind-sailing, paddle-boarding and even water-skiing). 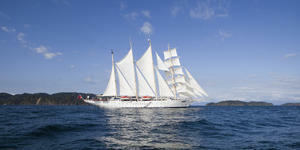 Island Windjammers focuses more on the joys of sailing than on over-the-top shipboard amenities. The line offers sailings in the Windward Islands from Grenada on the 10-passenger Diamant; its 24-passenger schooner, Sagitta, sails Leeward Islands cruises out of St. Maarten; and 26-passenger Vela offers a mix of both. Other itineraries include the French West Indies and the British Virgin Islands; look, too, for special themed cruises like Solo Sojourns (for those traveling alone), Rum Cruises, Pirates and Mermaid Week, and Taste of the (Caribbean) Islands foodie sailing. Swimsuits, cover-ups and T-shirts are typical daytime attire on these windjammer cruises, and dress for dinner and evenings remains refreshingly casual. Cabins come with A/C, and all but two offer portholes and private bathrooms. When not bunking down or out exploring in port, head out for some sunbathing or alfresco dining on deck, or retreat to the indoor dining room or lounge area. Voted as Cruise Critic's Best River Cruise Line for Value from 2015 to 2018, Emerald Waterways offers its passengers complimentary meals and beverages, transfers, activities at every port (in-depth shore excursions carry a fee), Wi-Fi, bicycles and gratuities (for both onboard and shoreside staff). Eight ships feature an aft area that serves as an indoor heated pool with a retractable roof during daytime and becomes a cinema on select nights. (Emerald Radiance has no cinema -- only a pool on the sun deck.) Passengers staying in rooms on the Vista and Horizon decks can also experience Emerald's open-air system, where the touch of a button opens the upper half of the cabin's floor-to-ceiling window to let fresh air in. Emerald's contemporary boutique hotel design completes the deluxe river cruise experience (with up to 182 passengers only) on the Danube, Rhine, Main, Rhone and Douro in Europe; the Mekong in Cambodia and Vietnam; Russia's Volga; and Egypt's Nile. 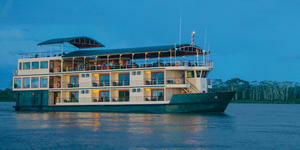 On all 17 river vessels, whether refurbished or newly built, Uniworld's signature is a daring, dynamic and colorful ambience. Public rooms and cabins are furnished in a high standard, with lush fabrics, antiques and original artwork nestled next to state-of-the-art amenities like flat-screen televisions, marble bathrooms and incredibly comfortable Savoir brand beds. Cuisine and service are on par with those found on oceangoing luxury vessels, though as the line's riverboats are significantly smaller, ranging in size from 56 to 196 passengers, options like alternative restaurants and entertainment venues are typically fewer in number. (Instead, each evening provides diversions that might range from local acts brought onboard in ports of call to bands that play for dancing). Most shore tours (and all in Europe) are included in the fares, and each ship carries a fleet of complimentary loaner bicycles. In addition to Europe, the line has scheduled voyages to Russia, China, Vietnam and Cambodia, India and Egypt. 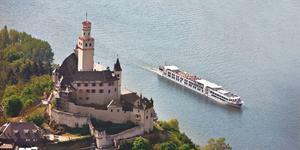 AmaWaterways sails to Europe's Rhine, Danube, Rhone, Douro, Seine, Mosel and Main rivers, as well as to Africa and Vietnam. The line offers ambitious regional cuisine, well-designed cabins and guided port stops (included in the fares) -- all set on some of the most modern river ships in the industry. The vessels, ranging in size from 28 to 196 passengers, come with contemporary decor inspired by the destination and amenities like in-cabin "entertainment on demand" systems (with Internet, music, movies and more), glass elevators, heated swimming pool or hot tub and mechanized wheelhouses that can be lowered to transit under low-slung bridges. For the daily tours, passengers receive wireless audio devices so they don't miss a word on history or culture. All ships in the European fleet offer 25 complimentary-use bicycles that passengers can use on guided tours or to explore on their own. No yacht? No problem! Family-owned SeaDream Yacht Club offers the next best thing with its twin cruising yachts, SeaDream I and SeaDream II, offering sophistication sans the pretense for a maximum of 112 guests. Onboard, passengers can enjoy the doting of a polished 95-person crew; locally inspired and international cuisine served up on deck or in an elegant dining salon; and included-in-the-rates wine, Champagne and cocktails. Onboard decorum reflects an "elegant casual" dress code. Look out for exciting extras like the option to sleep under the stars (on deck-side Balinese loungers) and a water sports platform with complimentary equipment (sailboats, kayaks, etc.) on loan. Mediterranean, Baltic and Caribbean SeaDream cruises incorporate hidden-away ports and activities with the crew, which are included in the pricing. Although Ponant's ownership has changed thrice in the span of its three-decade existence, the line has managed to remain true to its roots: a strong French influence and a five-star feel. Ponant's "French touch" features a French crew, a French way of living (French cuisine and wines) and prestigious partnerships, including interior design by Jean Philippe Nuel, spa products by Sothy's, Fragonard's signature perfumes and Pierre Frey fabrics. Its fleet consists of four mega-yachts (L'Austral, Le Boreal, Le Lyrial and Le Soleal), six mid-size yachts (Le Champlain, Le Laperouse, Le Bougainville, Le Dumont-D'Urville, Le Bellot and Le Jacques Cartier) and one small-capacity yacht (Le Ponant) sailing Mediterranean, Adriatic, Caribbean and other exotic itineraries. Ponant's all-inclusive fares (some shore excursions, drinks, internet and gratuities) are competitive and provide high value for money. The first of its kind to join the Crystal Cruises' fleet, 62-passenger Crystal Esprit is a luxury yacht with multiple restaurants offering top-notch cuisine, a gym, a spa and an expansive sun deck with a plunge pool and lounge. Its superb crew is consistent with the line's reputation for attention to passengers and detail. Most staterooms on Crystal Esprit are a comfortable 280 square feet, with a great king bed, lots of high-tech toys and lavish marble bathrooms. 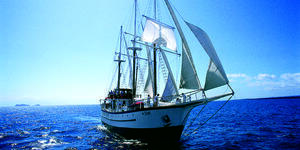 The ship sails destination-intensive itineraries predominantly in the Caribbean, Adriatic and Middle East. Activities on shore -- most of which are included in the cruise fares -- focus on kayaking, cycling, swimming, snorkeling and hiking, with a smattering of cultural and culinary tours. The ship's marina has a swimming platform and offers water toys, such as paddleboards, Jet Skis, water skis, snorkeling equipment and kayaks. Esprit's most unusual feature is its three-person submarine (tours at additional cost).